If I was a teenager living in this area, I would think one of the coolest jobs to have would be at Carowinds. "It isn't a summer job, it's a paid vacation," the website says. I wouldn't go that far, but as a teenager I imagine you'd be one of the cool kids if you worked where tons of people came to have fun, including many your age. The amusement park on the North Carolina-South Carolina border is now accepting applications and conducting on-site interviews for all departments. It plans to hire more than 2,100 seasonal employees for its 2011 season, which begins when the park opens Saturday, April 2. I referenced teenagers because young people usually want "cool" jobs, but these jobs are often desirable for people of all ages, particularly those who look for seasonal work (teachers, retirees, etc.). Seasonal positions are being offered in the areas of food and beverage, rides, games, merchandise, admissions, marketing, aquatics, security, warehouse, cash services, and guest services. The age requirement for many of these positions is 15 years of age or older (some are 18 or older). 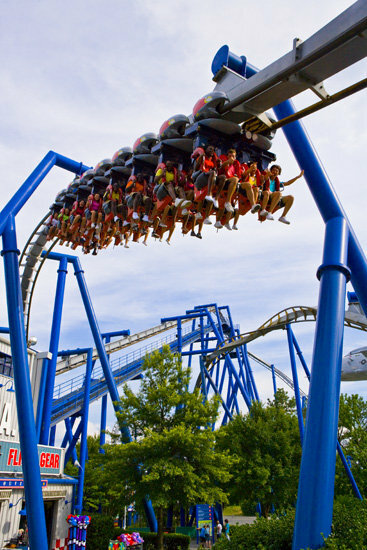 For more details and for an online application, which must be filled out before you go to the Carowinds Employment Office, visit www.jobs4fun.com. Carowinds will also hold auditions for live entertainment on Saturday, February 26, 3-6 p.m. The park is seeking trained, talented, and experienced actors and characters for the 2011 entertainment season, and those auditioning should bring a one-page resume and current photo. Stage managers and supervisors are also being hired. Actors should be prepared for a cold read and be prepared to sing as well. A short dance routine will be taught by a choreographer so wear comfortable clothing and shoes (no flip-flops). You will also need to fill out an application before audition day, at www.jobs4fun.com or in person at the Carowinds Employment Office.